Robert E. Lee bares the flag. In yet another instance of institutions retracting the Confederate flag, the dean of Washington National Cathedral has called for two stained-glass windows featuring the flag to be taken down. The prominent building on D.C.’s skyline includes windows honoring Confederate generals Stonewall Jackson and Robert E. Lee, each containing an image of the controversial flag. 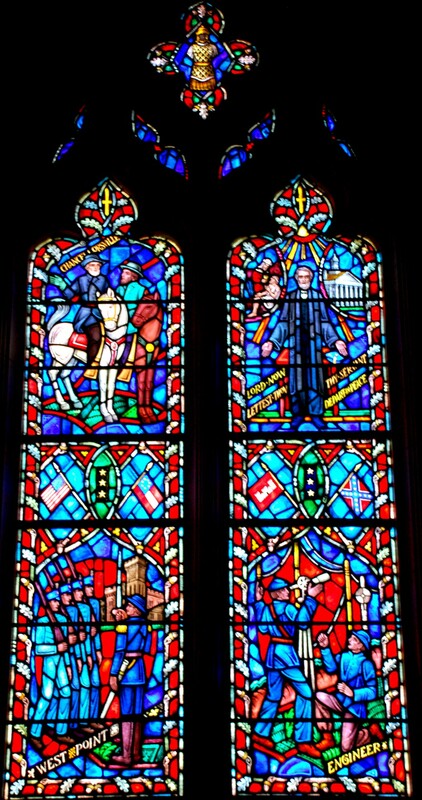 “The Cathedral installed these windows, in part, because its leadership at the time hoped they would foster reconciliation between parts of the nation that had been divided by the Civil War,” said the Very Rev. Gary Hall, who has called for the governing bodies of the cathedral to remove the windows that have been there since 1953. But at a time when the nation is mourning the killings of nine people at Emanuel African Methodist Episcopal Church in Charleston, South Carolina, Hall said the cathedral should take a different approach. He also cited the recent killings of unarmed Black men at the hands of police officers. “Here, in 2015, we know that celebrating the lives of these two men, and the flag under which they fought, promotes neither healing nor reconciliation, especially for our African-American sisters and brothers,” said Hall. The cathedral’s announcement comes as religious and political leaders have called for the flag to be taken down from the grounds of the South Carolina State House and elsewhere. Recently the board of visitors of the Citadel and the Military College of South Carolina voted 9-3 in favor of removing the Confederate Naval Jack from its chapel “to an appropriate location” on its campus. Silverman, who visited the cathedral a few years ago during a trip to Washington, said he noticed the red and blue panels that featured the Confederate flags and thought it was “really odd” that the cathedral included them. He noted that the decision to install them came just before the landmark 1954 Brown v. Board of Education decision against school segregation.